The Bangla web Corpus (bnWaC) is a Bengali corpus made up of texts collected from the Internet. The corpus was prepared by the Corpus factory method, a method for developing large general language corpora which can be applied to many languages (A. Kilgarriff et al 2010). Corpus texts are available with lemmatization and POS tagging. This Bangla corpus has the part-of-speech tagset for Bengali created using an Annotation tool developed in Microsoft Research India. Bali, Kalika, Monojit Choudhury, and Priyanka Biswas. Indian Language Part-of-Speech Tagset: Bengali LDC2010T16. Web Download. Philadelphia: Linguistic Data Consortium, 2010. BARONI, Marco; KILGARRIFF, Adam. Large linguistically-processed web corpora for multiple languages. In: Proceedings of the Eleventh Conference of the European Chapter of the Association for Computational Linguistics: Posters & Demonstrations. Association for Computational Linguistics, 2006, pp. 87–90. Kilgarriff, A., Reddy, S., Pomikálek, J., & Avinesh, P. V. S. A corpus factory for many languages. In LREC, May 2010. 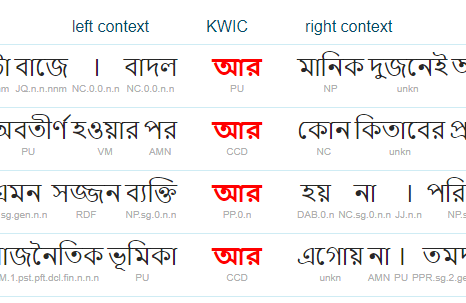 Sketch Engine offers a range of tools to work with this Bengali corpus.